Salah, or our ritual daily prayer, is the most important aspect of our lives. Allah has mentioned the prayer nearly 700 times in the Quran, and has given special praise for those who pray. For all the commands Allah sent Jibreel down to our Prophet (peace be upon him). But the salah was so important that Allah brought the Prophet up to Himself to give him the command of the five daily prayers. Prayer is the connection between a slave and His Lord. It is that one deed that we cannot let go of no matter what happens. So how do we better it? 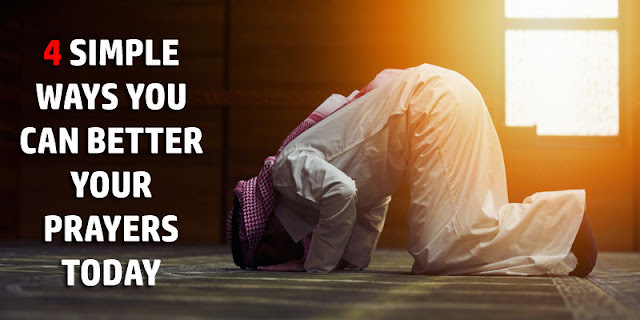 A better salah is one that elevates our ranks as believers, that brightens our faces, eases our worries, and helps as a shield against our sins. 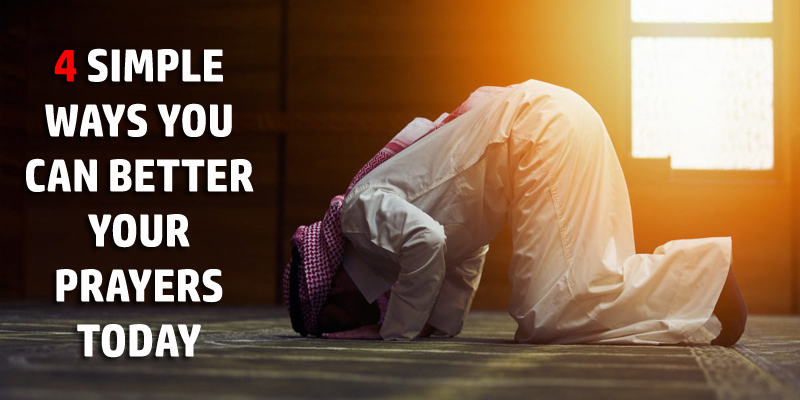 We will look at four simple tips to make your salah better—two physical tips and two spiritual tips for an excellent prayer! Among the things that researchers say helps heighten our interaction with the world around, with nature and with our own selves is to pause at times and go through our daily motions with alertness. One of the reasons we feel so inadequate with our prayers is because we rush through them. We stand, then bow, then stand again, then prostrate— all within about 15 seconds! Calm down! At every position just pause for a couple of seconds. When you are in ruku’, stay there for a while before you recite subhana rabbial adheem. When you prostrate in sujood, go still for a couple of seconds and feel the position and your submissiveness before you recite subhana rabbial a’laa. Another thing we rarely notice about our Ferrari prayers is that we hardly take time to breathe in and out! At every position whenever you pause, take a full breath in, and a full breath out. Feel yourself in the submission of ruku, sujood and sitting down with your head bowed in submission to Allah. Feel the serenity of each position as you pause, breathe, and then recite what is to be recited in each position. The result: a transformed prayer! What is the point of a conversation if we do not understand what we are saying? Learning to understand the words we read in prayer are essential to increasing our concentration. We will no longer run over the Fatihah in five seconds, but we will understand each line and focus on it. The lessons will embed in us over time and improve us spiritually and emotionally. We will understand the words of Allah and we will connect to Him. Going one step beyond understanding is to contemplate. It is to actually stop and think about what Allah is saying. It is to be there in sajdah amazed by the grandeur of saying Subhana Rabbial a’laa (Glory be to Allah the Most High). It is to wonder how we glorify the Most High when we are the most low. It is to ponder upon the verses we recite and seek to find meaning within ourselves. It is when we not only understand the words but think deeply about them. This will take our prayers to another level altogether! May Allah grant us all a deep khushoo’ in our prayers.